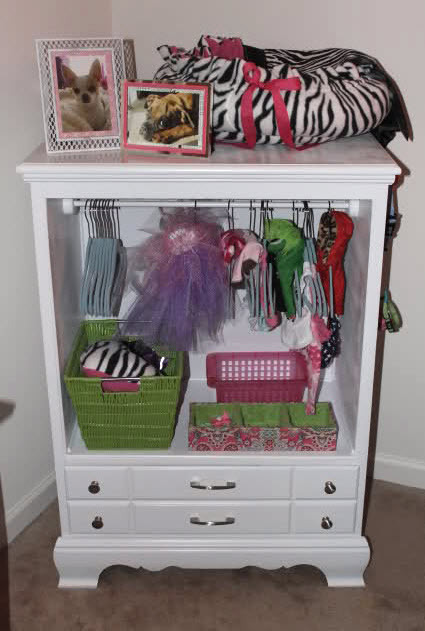 Turn a regular dresser into a dresser for your dog! Get a tall dresser that has small drawers on the base and remove the large drawers from the top. Remove the hardware for the large drawers inside the dresser. Put cross beams along the inside of the dresser walls, cut pieces of plywood to fit each wall, and attach the walls inside the cavity. Attach a closet pole inside the open area, then paint the dresser. Put hooks on the outer sides of the dresser for extra hanging items, such as your dog’s collars or leashes.